Need a sweet treat to make for a party or just an afternoon snack? These Chocolate Chip Cookie Dough Balls are the perfect delicacy for you and all of your cookie dough loving friends! If it was acceptable( and healthy) I would just eat the cookie dough of all the cookies I made instead of baking them. What is it about the dough that’s so good? 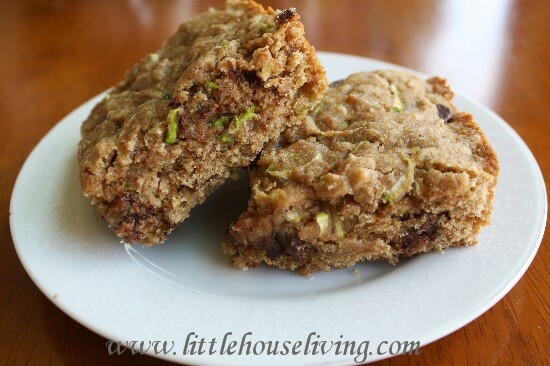 This recipe combines two of my most favorite foods, chocolate and cookie dough. Can it get any better than that? Whip the butter and the brown sugar until fluffy. Add in the rest of the ingredients and about 1/2 c. of the chocolate chips. Let the dough cool off in the fridge for about an hour or until firm enough to handle. After the dough has cooled, form it into little balls. This recipe will make quite a few! Put the balls in the freezer for 2 hours or until hard enough for the next step. Melt the rest of the chocolate chips and coat the cookie dough balls. I decorated mine with some things I had in the pantry, like the white chocolate chips I melted for the one on the back right of the picture and the one on the back right of the picture has crushed Butterfinger’s on it. 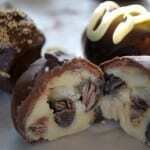 Need the printable recipe for these Chocolate Chip Cookie Dough Balls? Grab it below! chocolate chips you will need at least 2 bags! 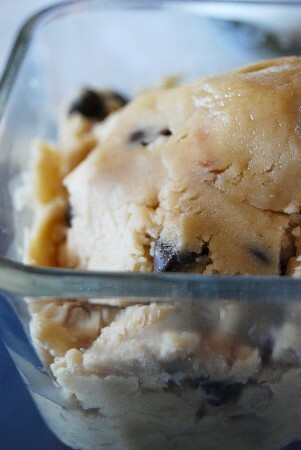 Add in the rest of the ingredients and about 1/2 c. of the chocolate chips. Let the dough cool off in the fridge for about an hour or until firm enough to handle. After the dough has cooled, form it into little balls. This recipe will make quite a few! Put the balls in the freezer for 2 hours or until hard enough for the next step. Melt the rest of the chocolate chips and coat the cookie dough balls. 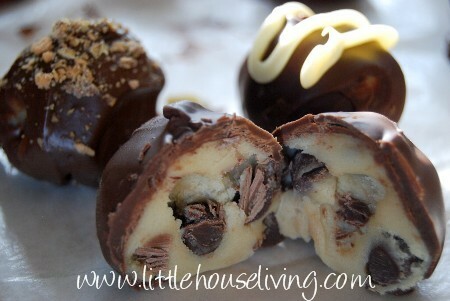 Would your family enjoy this recipe for Chocolate Chip Cookie Dough Balls? 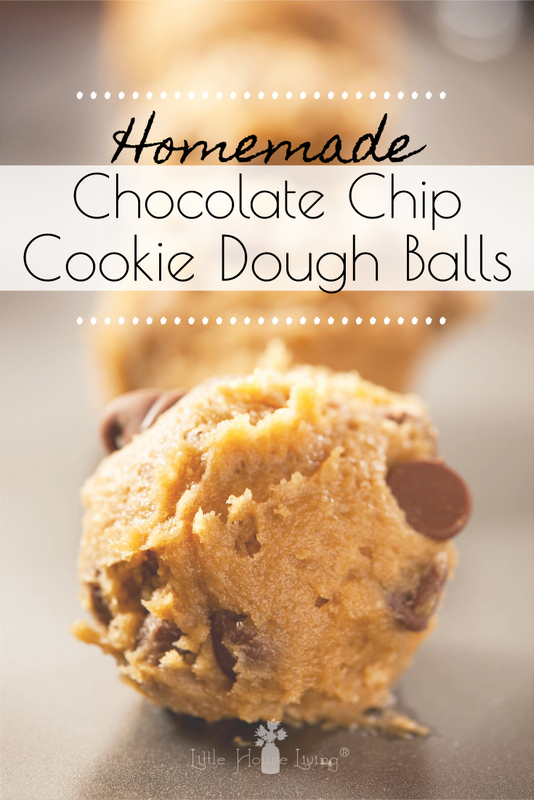 This recipe for Chocolate Chip Cookie Dough Balls was originally published on Little House Living in December 2010. It has been updated as of April 2019. Mmmm…Im going to have to try those for sure! They look so yuuummmmyyyy my sister in law and are racing to see who’ll make them first. I’m going 2 try this tommorrow definately!!! Thanks so much! This is on my list for cookies! Thanks!!! Mmmmm sounds so yummy!! Going to make these. These are my son’s favorite! I make them every Christmas. I make them ahead and freeze them. I’m lucky if they make it to Christmas because he keeps sneaking in the freezer and eating them! Please tell me how you would need to store these? I would keep them in the fridge. Hello! I would like to try these, they look yummy! I would like to clarify though, do you leave the flour raw or do you cook it on the stovetop? You did mention about cooling off the mixture… Thanks! This recipe does not need to be cooked, the dough just needs to be “chilled” in the fridge for a while to harden up a bit before you add the chocolate. Can’t wait to try these. Can you please tell me how much does a stick of butter weigh? I live in New Zealand and butter is sold in 500gram blocks here. I have been enjoying your site, especially as we are going to be little house living very soon! Thanks for all the great tips and recipes. I’m not sure what it weights but a stick of butter is 1/2 cup or 8 tablespoons. How many does this make? I am making them as gifts and not sure how many batches I need to make. About 2 dozen depending on how big you make them. I have never seen canned milk in a cookie recipe before. What does it do? Make sure you use SWEETENED CONDENSED MILK. A good brand is “Eagle Brand”. It comes in white or chocolate flavors. I have never tried the chocolate flavor. It will add sweetness and moisture. Baby Shower this weekend and they want some cake pops…I think these will be a great surprise for everyone! Cake Pop Anyone?! ?